My boss is a really great man and he likes to give money to non-profits and stuff like that. His newest idea was to donate lunch to the Police and Fire departments. 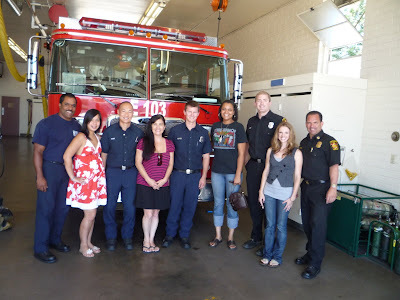 At the police department there were 190 people and the fire station was 6 Firemen plus the Caption, Chief and his driver. 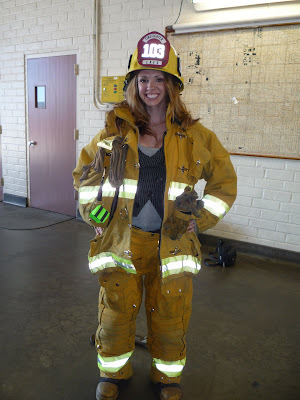 So a few of us from the office went to have lunch with the Firemen. Since the Chief was there he OK'd us to take a drive in the Fire Engine! He said not too many people are allowed to do it, so we felt really special. We also were allowed to wear the uniforms. It was so much fun and we will be going back tomorrow and Thursday because the shifts are different every day! 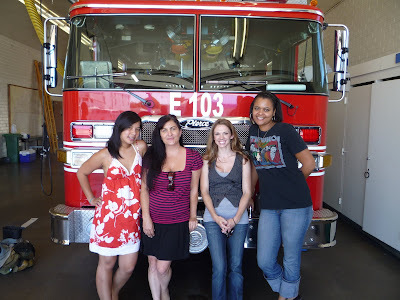 Some of the Firemen, The Chief and us girls. Mimi, Cynthia, Me, and Janeen.